The student city of Pietermaritzburg is the capital of KwaZulu-Natal. It is famous for sports events like the Comrades or Dusi Marathon. 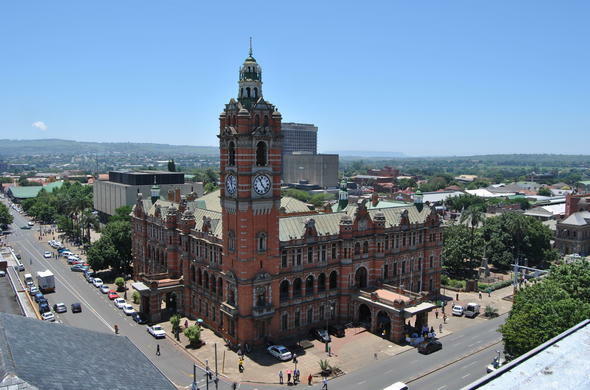 Visit the city hall in Pietermaritzburg, the largest red-brick building in the Southern Hemisphere. Nearby game reserves or the beautiful countryside invite visitors to have a closer look at KwaZulu-Natal. Rich in history, Pietermaritzburg boasts a variety of galleries or museums. For tranquility seekers a stroll through the Botanical Gardens is the perfect opportunity. This delightful city in has strong Victorian roots with evidence in the well preserved architectural style of the buildings and general ambiance. The surrounding countryside has attractive forests, rolling hills and valleys and it is not surprising then that the Voortrekkers, who arrived here in 1837, decided to settle on fertile land alongside the Umsindusi River. Pietermaritzburg was founded in 1838 and named after two leaders of the Voortrekkers Pieter Retief and Gerrit Maritz. The village was later taken over and made into a British military garrison as a defence in case of attacks. Many German and British immigrants settled here over the years as the town flourished, quaint Victorian and Edwardian buildings and features remain today. This city is now the administrative capital of the KwaZulu-Natal province. Pietermaritzburg is centrally located between Durban, the mountain range of the Drakensberg and KwaZulu-Natal's game reserves. It also stands on the edge of the wonderful Midlands Meander, a lovely scenic drive with many places to stop for art, craft, teas, meals and local produce as well as country accommodation. This city is on the main N3 highway approximately 80km (50 miles) north of Durban by road; there is also an airport with good connections to other cities.A city rich in history and heritage, Pietermaritzburg has a number of museums, galleries and monuments of interest, historical buildings include The City Hall, Macrorie House, Natal Museum, Old Colonial Building, Old Government House and Voortrekker House. The historic Railway Station became famous when Mahatma Ghandi was evicted from a train here in 1893, an event that set him on his political path. The newest museum here is Comrades Marathon House, the headquarters for an epic yearly road race between Pietermaritzburg and Durban which takes place at the end of May. The direction of the run alternates each year, one year downhill and the next uphill; its a gruelling 90km (56 miles) and one of the toughest races in the world. Another interesting sport event that occurs here every year is the Dusi Canoe Marathon on the Umsindusi River which takes place over a strenuous 3 day course. Church Street, in this attractive KwaZulu-Natal city, has been converted into a pedestrian walkway and mall, a pleasant place to shop, browse and relax, there is also an interesting African Arts and Crafts centre with contemporary and traditional hand made works on display including rugs, batiks, jewellery, sculpture and collectors items. There are a number of parks, gardens and reserves around this city including the lovely Pietermaritzburg Botanical Gardens and across from the City Hall, the Garden of Remembrance - for the fallen in two world wars and the Weeping Cross of Delville Wood.